Only three actual games made it into the Nintendo Download this week, but when one of them is Sakura Samurai: Art of the Sword of the 3DS you don't really need much else. A sword fighting game that's all about timing and strategy, Sakura Samurai tells the tale of a young boy on a quest to master the sword and rescue the lovely Princess Cherry Blossom from her vile captors. Only by mastering drawing his weapon and using his momentum to strike can he hope to reach his noble goals. He might take a break to slice fruit now and again. 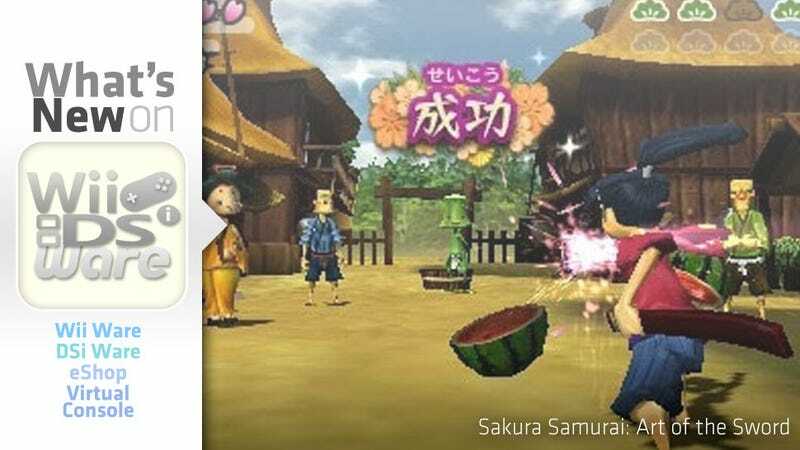 Available today for the 3DS, Sakura Samurai is a game that Nintendo really thinks fans will dig. You can tell by the fact that it's got its own sub-website off on Nintendo.com rather than a generic entry in the site's game catalog. Check out the list below to see what else makes it to the downloadable table this week, and be sure to click on the game titles to visit Nintendo's official game pages. Breaking news from Mumbai, India: The Gateway of India was stolen a few hours ago. It looks like an open and shut case of V.I.L.E villainy. The Chief wants ACME's best agent on this, and that means you, detective. Get to Mumbai fast and find the arch-criminal who carried out this monumental malfeasance. Carmen Sandiego is back and only you can foil her V.I.L.E plans. Travel the globe, solve brain-twisting math puzzles, and catch the villain behind the Great Gateway Grab. Crack the case of the Great Gateway Grab in single-player Story Mode. Perfect your math skills in single-player Practice Mode. Challenge your friends and family to solve math puzzles against the clock in Multiplayer Mode. In Carmen Sandiego Adventures in Math, you practice your math skills and use them to fight crime. Ideal for grades 4–5, math topics include arithmetic, logic puzzles, fractions and much more! • Travel the world, solve math puzzles and fight crime! • Math topics include geometry, fractions, and many more! Travel a world rife with beauty and danger to rescue the legendary Princess Cherry Blossom. Her kidnapper has placed dozens of blade-wielding henchmen in your path. Sakura Samurai: Art of the Sword is a swordfighting action game that is simple to play. Just use the A Button to attack, and the B Button combined with the Circle Pad to dodge. The secret of Iai is not reckless swinging, but rather one well-timed, swift attack. Aim for openings in your enemy's guard–in the instant after you've dodged an attack, or just before he swings.